For the month of July, The Shhh Cooking Secretly group decided on #Chutneys as the theme. The chutneys I’ve seen so far by the participants are so varied. But then why not as many regions of India have their own chutneys to boast about. We make them from herbs, dals, vegetables, fruits, dairy products, basically anything. I remember my grandmother would not allow us to throw away the peel of cucumber. She would instruct me how to make that into a chutney. Back then we didn’t have any fancy electrical gadgets. She would make me pound the cucumber peels, coriander, ginger and chilli using a mortar and pestle. And a delicious chutney would be ready in no time to dip our bhajias into or to smear on rotis. Before I ramble on more about Chutney, let me remind you what the group is all about. Started by Priya of Priya’s Versatile Recipes, every month participating members are paired up. Then according to the theme we give each other 2 ingredients that we have to use in our preparation of the dish. This month I was partnered with Sujata Shukla of Pepper On Pizza . She is a new comer to the group but I’ve already become pretty friendly with her. She gave me apples and onions and I gave her cherries and onion. Since she is in US visiting her daughter and family, and cherries are so in season I thought of challenging her with cherries. She has come up with a lovely chatpatta chutney. The word chutney was used by the British during the British Raj. It originates from the Hindi word chatni. The Anglo Indians quickly adapted the British way of making chutneys or relish by using vinegar, fruits, sugars to make the chutneys last longer. Chutneys are used to serve alongside starters as a dipping sauce, or as a topping for chaat dishes. Chutneys are smeared on breads, parathas, rotis and stuffed with vegetables to make a wholesome meal. I love the smearing bread with chutney topped with tomatoes, cucumber and cheese to make a delicious sandwich.Some use chutneys to smear on meats and fish before cooking. Coat roasted vegetables with chutney before serving. Chutneys elevate the dish with a burst of flavours.. sweet, tangy, sour, salty, chilli and sometimes even with a bit of bitterness. I decided to make my chutney with green apple as its a bit sour and used a generous amount of spring onion and fresh coriander. The chutney turned out so refreshing and tasted great with the gathias and the remaining was used to serve with some dokhra. The amazing thing about this chutney is that even after a week in the fridge it did not change colour at all. It still had the light fresh green colour. Peel and core the apple. Cut it into small pieces. Add the chopped apple, spring onion, coriander, ginger, garlic and chillis into a food processor. Process the chutney. You can make it into a fine paste or leave it slightly coarse as I did. Take the chutney out into a bowl or jar. Add salt, sugar and lime juice and mix well. I removed the peel from the apple because it was coated with wax. If you get organic ones then leave the peel. Adjust the taste of the chutney according to your preference. Use mint instead of coriander for a different taste. Mayuri at the first glance I thought it was ridge gourd. Looks totally yumm!! Innovative chutney.. Love to taste it ! Absolutely gorgeous and tempting chutney! Never thought about using spring onion in chutney! Amazing .. I can just imagine the sweet and tangy flavours of the chutney. This is so awesomely innovative!I have bookmarked this recipe! 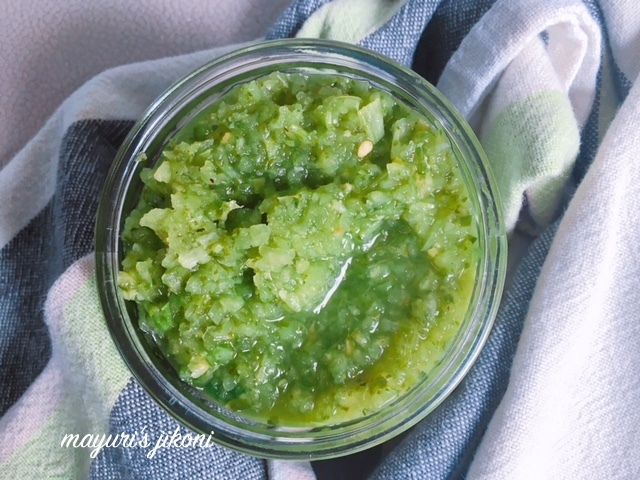 🙂 🙂 Veena till I read the other chutney posts, didn't know that chutneys can be made with ridge gourd. Priya it tasted good, we loved and it stayed in the fridge without changing colour for over a week. Neither did I till I thought of using all green ingredients for the chutney.. thus the idea of spring onion. I enjoy challenges. Loved the chutney. do try it Prathima, it tasted good with sandwich too. The green apple chutney looks so inviting! I would love to try this soon! Fabulous, what a weblog it is! This webpage presents useful facts to us, keep it up.